USC now has eight assistant coaches and can hire one more full-time assistant. Early Monday in Seattle, Chris Petersen announced the staff he prepares to go to work with as he enters his first year as head coach at the University of Washington. Noticeably missing from that announcement on the school’s website — aside from recently in the news Tosh Lupoi — was Justin Wilcox, who spent the previous two seasons as the school’s defensive coordinator. Washington didn’t waste any time getting to the news either. On the second line of the announcement Pete Kwiatkowski was announced as defensive coordinator. By Monday evening, USC made it official announcing Wilcox will be joining Steve Sarkisian’s staff as their new defensive coordinator. Sarkisian has also brought in Marques Tuiasosopo (from UW) to coach tight ends and Tim Drevno (from the 49ers) as the offensive line coach. Wilcox was in the news recently. Having previously coached at Boise State, there was thought that he may remain in Seattle under Petersen. With the most recent news that Oregon longtime assistant Nick Aliotti would be retiring, there was talk that Wilcox, an Oregon alum, could end up in Eugene. Once all the dust settled he ended up at USC with Sarkisian as expected. Wilcox’s arrival at USC had been widely speculated after Sarkisian took the job and eluded to the type of defense the Trojans would play. The writing became even clearer once it was learned former defensive coordinator Clancy Pendergast would not be retained. Wilcox joined Sarkisian’s staff and turned around a defense that was ranked 106th in the nation before he got to Seattle into a unit that ranked 31st in the nation in 2012. The Huskies ranked 55th in the nation in total defense in 2013. Under Pendergast, USC ranked 13th in the country in total defense in 2013 at the time of Monday’s announcement. Also coming with Wilcox from Washington is Marques Tuiasosopo, who guided the Huskies to a 31-16 win over BYU as interim head coach in the Fight Hunger Bowl last week. San Francisco 49ers assistant Tim Drevno has been hired as offensive line coach and running game coordinator. In total, five assistants join the USC staff from Washington, which does not include strength and conditioning coach Ivan Lewis who will serve the same role with the Trojans, according to the school. 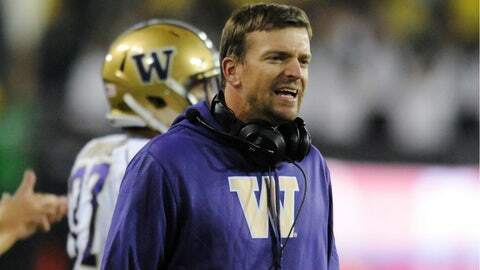 Peter Sirmon, another former UW assistant who was among the first hires Sarkisian made after getting the USC job, will serve as recruiting coordinator in addition to coaching linebackers. Tee Martin and Clay Helton are the only holdovers from the USC staff that guided the team to a 10-4 record in 2013. They will retain their same roles — Martin as wide receivers coach and Helton as offensive coordinator and quarterbacks coach.